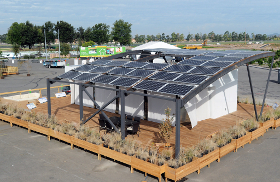 West Virginia University and University of Roma Tor Vergata's STILE house placed 12th overall at the U.S. Department of Energy Solar Decathlon 2015. STILE (Sustainable Technologies Integrated in a Learning Experience) was relocated in August 2017 to the Tellus Science Museum, a museum dedicated to educating the public about geological, mechanical, and sustainable sciences, located in Cartersville, Georgia. There, STILE replaces Georgia Tech’s Solar Decathlon 2007 home in the museum’s “Solar House” exhibit. Guests can walk through the house and learn more about sustainable sciences and modern movements in sustainable design. Public tours: Watch http://tellusmuseum.org/galleries-more/solar-house for tour information.